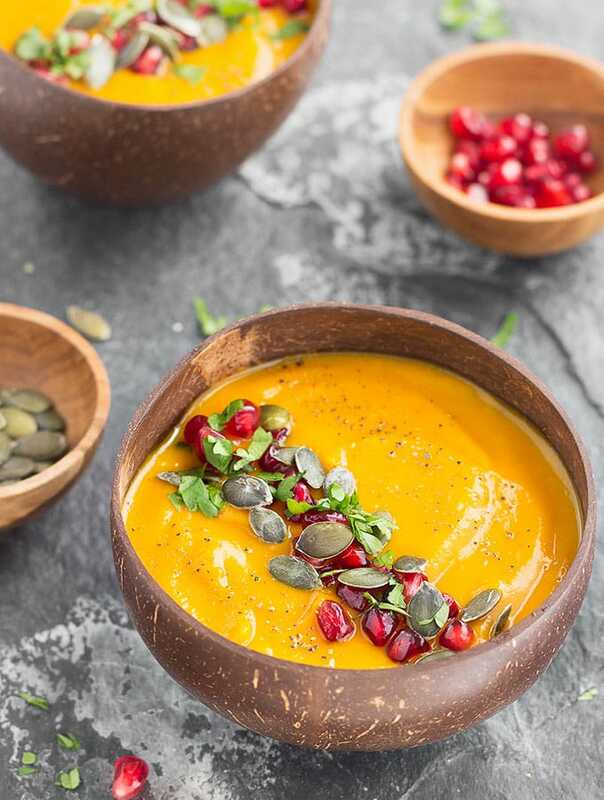 Roasted Pumpkin Apple Soup – Naturally gluten-free, dairy-free, vegan, and ready to eat in just under 1 hour! 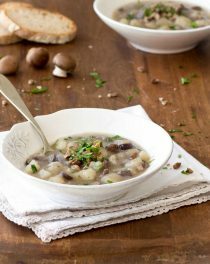 This flavorful, comforting soup is ideal for those chilly fall evenings when you want something simple and healthy. Even without added cream, it has a creamy, velvety texture and the right balance of savory, sweet, and spicy. The recipe couldn’t be easier to follow and you only need a few ingredients. Spread the pumpkin, apple, onion and garlic out onto a pan, sprinkle with salt, drizzle with little oil, and bake for about 40 minutes. Then, place everything in a food processor, add the vegetable stock, and puree until it’s silky-smooth. 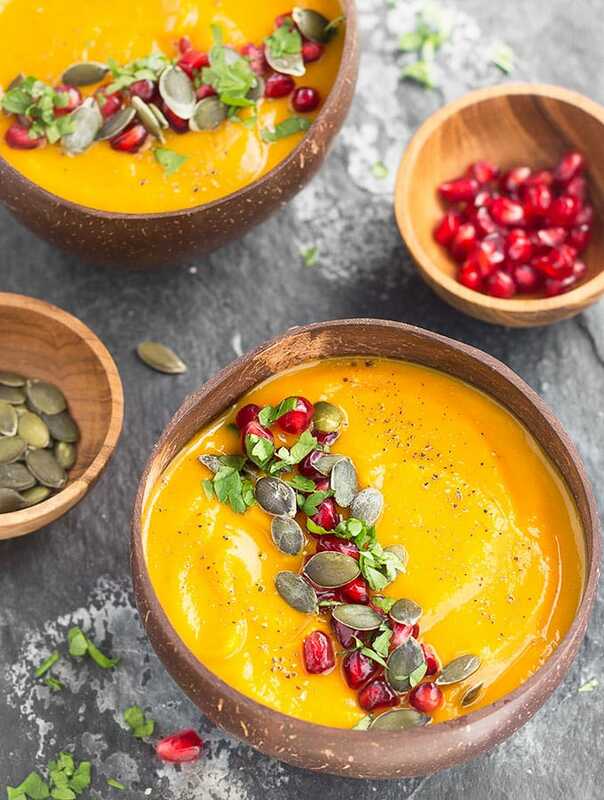 To serve, ladle the soup into bowls, and top it with pomegranate arils, crunchy pumpkin seeds, chopped parsley, and a sprinkle of freshly ground black pepper. 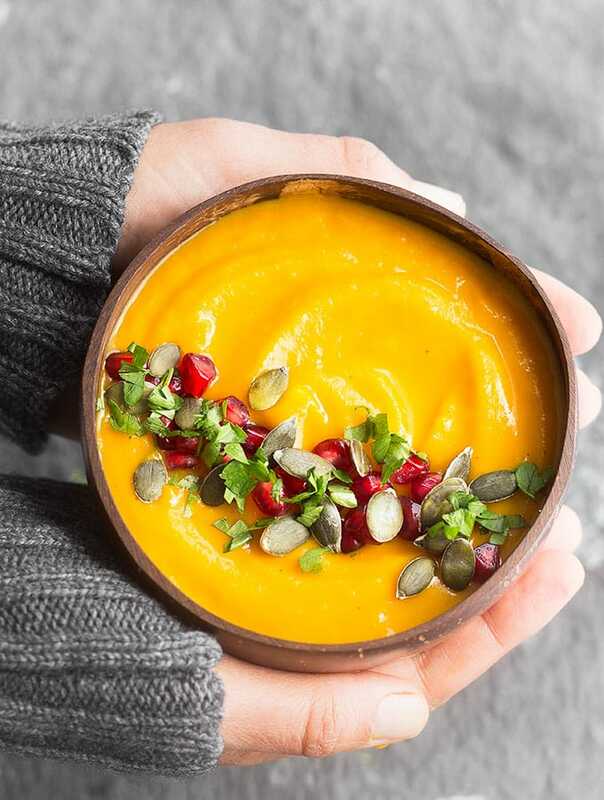 Roasting the pumpkin is the only part that takes a bit of time, but don’t skip this step as it gives the soup a greater depth of flavor and brings out the sweetness of the pumpkin. Once this is done, it takes less than 10 minutes to finish it up. 1. Fill the blender only halfway. 2. Remove the center piece of the lid to allow the steam to escape. 3. Cover the blender lid with a clean kitchen towel and keep most of the hole covered. This soup has a rich consistency, but, if it is too thick for you, feel free to add more vegetable stock to thin it out. I love using tart apples, such as Granny Smith, to balance the sweet flavors. Roasted pumpkin apple soup makes a delicious light lunch or dinner, and would be perfect served alongside some crusty bread or a hearty salad. It can be made in advance and reheated when needed. Refrigerate leftovers in an airtight container for up to 4 days, or freeze for up to 1 month. If you give this roasted pumpkin apple soup a try, let me know what you think. Leave a comment, rate it, and don’t forget to take a picture and share it on my Facebook page or tag it #aseasyasapplepie on Instagram! I love seeing what you come up with! 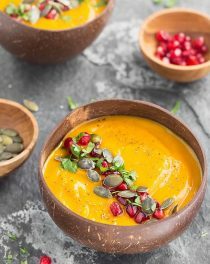 Roasted Pumpkin Apple Soup - Naturally gluten-free, dairy-free, vegan, and ready to eat in just under 1 hour! Cut the pumpkin in half lengthways and scoop out the seeds. Then, slice each pumpkin half in half again to make quarters and place, cut-side up, on a baking tray, along with the onion. Bake for 20 minutes, then add the garlic and apple, flip the pumpkin cut side down and roast for another for 20 minutes, or until the flesh is soft. Use a spoon to carefully scoop out the flesh of the pumpkin (discarding the skin) and transfer to a high-speed blender along with the apple, onion, garlic (remove the skins), cayenne, vegetable stock. Blend on high for 2 minutes, or until silky smooth. If it's too thick, add a bit of vegetable stock to thin it out and blend again. Taste and adjust seasonings. 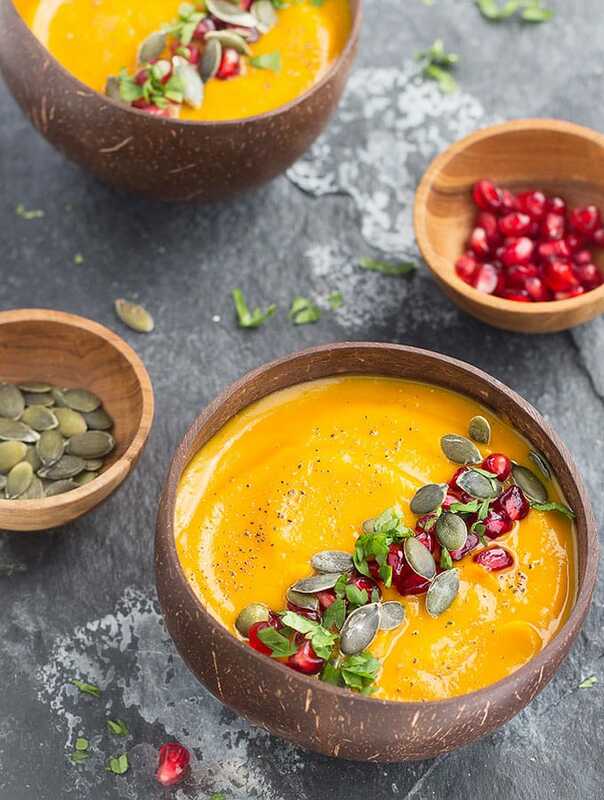 To serve, ladle the soup into bowls and top with pomegranate arils, pumpkin seeds, fresh parsley and freshly ground black pepper. Hi Katarina! Serves 2 as a main (1 1/2 cup each serving ) or 3 as a side (1 cup each serving). Nutrition facts are for 1 cup of soup. 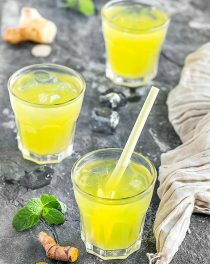 I minced up a few discs of fresh ginger and added it when I threw everything in the blender. Since I didn’t have any pomegranate prepped and ready and because I was feeling moderately lazy, I topped w/ pepitas, dried cranberries, and sliced avocado. Probably now my favorite ‘tastes like fall’ soup. This was amazing soup. The tartness of the apple with the addition of the pomegranate seeds, really gave a nice freshness to the soup. Just wonderful. It’s not fair to give my recipe a 2-star rating because you don’t read the instructions! Any tips on cooling it down if I accidentally put too much cayenne?? Glad you enjoyed this soup, Lindsay. If you put too much cayenne you can add more vegetable stock or a dollop of plain yogurt over each serving.